If you are looking for a cozy, charming beach hotel in Kamari, Santorini Island, Alesahne Beach Hotel is the ideal choice. Set in the beautiful Kamari Beach, Alesahne Beach Hotel, offers a relaxing environment and chic, elegantly designed rooms. Amongst the most visited spots in Santorini Island, Kamari black sand beach is considered the place to be. 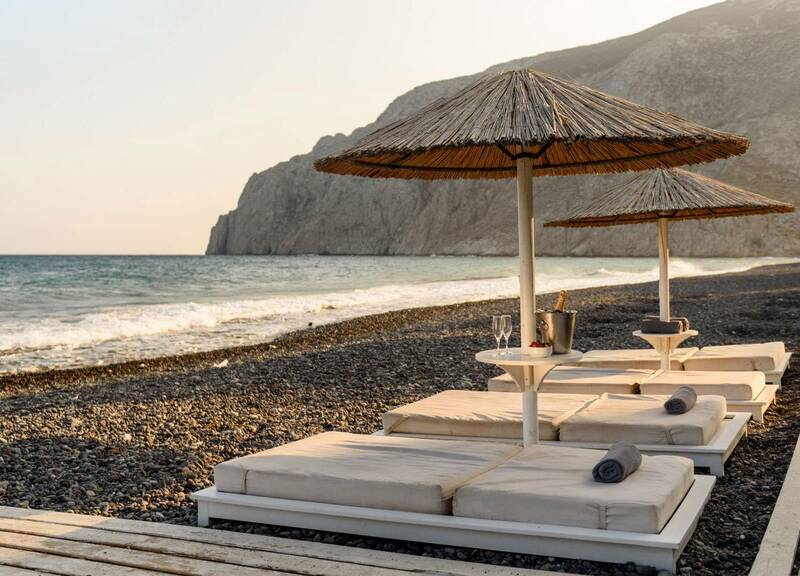 Alesahne Beach Hotel in Kamari, Santorini, is situated in front of the breathtaking volcano black sand beach, offering you the ideal setting for 'eruptive' Santorini Island vacations. Alesahne 4 star hotel in Kamari, is a small haven amidst the diverse and crowded Kamari beach in Cyclades Islands, Greece. This picturesque beach hotel in Santorini is the ideal choice for those looking for value for money vacations in Santorini Island. If you wish to combine a cosmopolitan lifestyle with relaxing beach moments, this family friendly hotel in Kamari beach is the perfect choice for your stay in Santorini, the volcanic jewel of the, Cyclades Islands in Greece. If you dream of spending your holidays in a small yet elegant hotel on the beach, Alesahne beach hotel in Santorini is your dream come true. Only a breath away from the vibrant black sand beach in Kamari, this charming hotel on the beach, is the perfect solution for those seeking a family friendly, easy access hotel in Cyclades Islands, Greece. In Alesahne Kamari beach hotel, you will enjoy 4 star hotel accommodation combined with warm and high quality service in affordable prices. So, if you are wondering where to stay in Santorini, the Alesahne hotel in Kamari beach is your number one choice. Alesahne 4 star hotel rooms in Kamari provide easy access to a number of stunning beaches in Santorini as well as tavernas, cafes and shops around this beautiful island of Greece. Enjoy your private beach in Kamari, as the hotel provides exclusive guest space with sun beds and umbrellas situated along the beach.